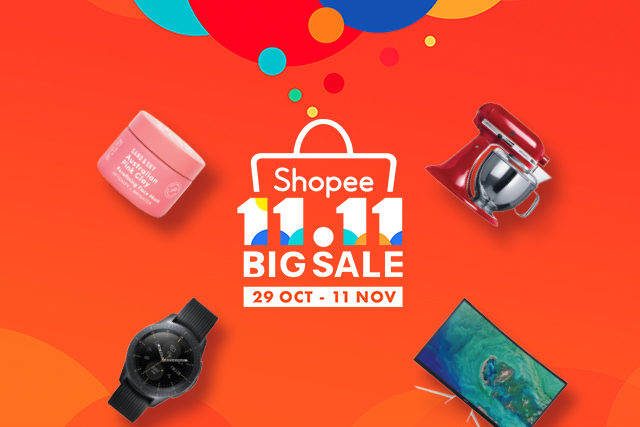 Shopee 11.11 Big Sale is Finally Happening! Here's a Sneak Peek. We’re starting off the countdown with special category and shop vouchers that will be released at 12 midnight. 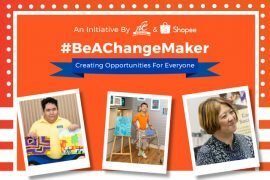 Besides this, there will also be limited vouchers up for grabs such as Grab vouchers, ofo 30-Days Pass and Marina Square dining vouchers. Hurry, set your alarms now! Mark your calendars because you can get up to 90% off the latest phones, gadgets, game consoles, laptops, smart home appliances and more on 30 Oct! What kind of deals are you looking at? 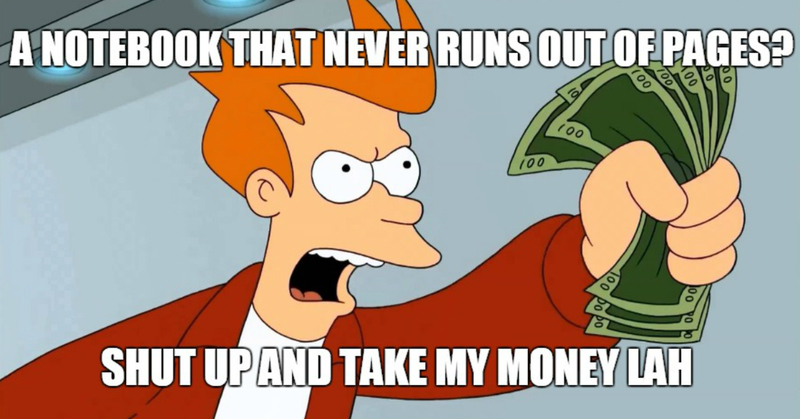 Well… a little shrimp told us that the latest GoPro Hero 7 will be on sale at up to 20% off and JBL Mystery Boxes will only be going for $49 (U.P. $154.70). Trick or treat? We’re treating you with a Shopee Shake Day on 31 Oct! There will not only be an upsized coin pool, but also NINE Shopee Shake sessions for you! 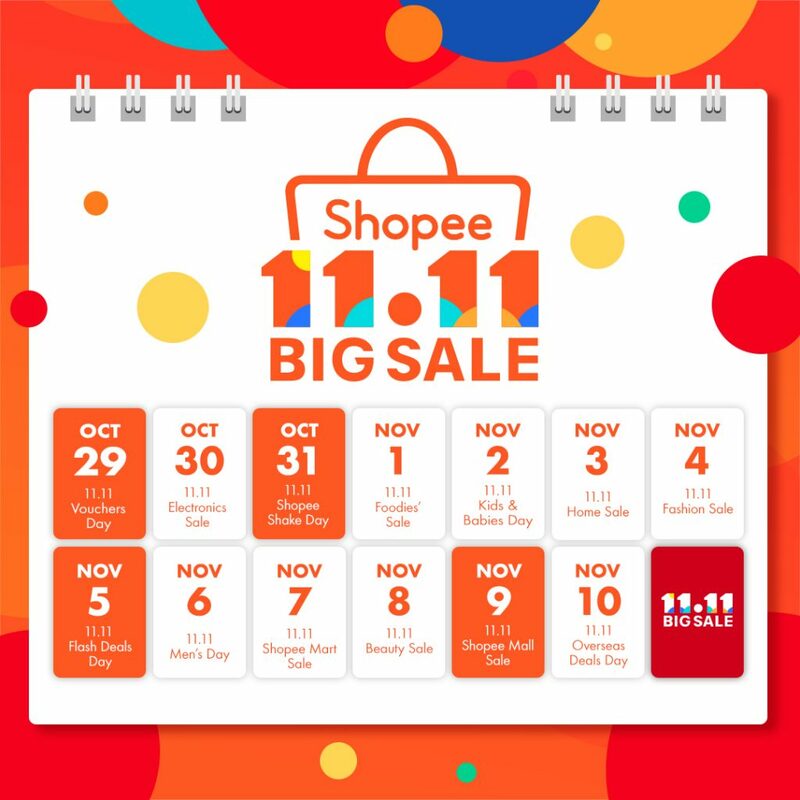 (Instead of the usual two at 1pm and 9pm) So start setting your alarms now and jio up to 10 friends at 12am, 9am, 11am, 1pm, 3pm, 5pm, 7pm, 9pm and 11pm because there will be bonus Shopee Coins up for grabs too! This is for all foodies out there. Enjoy up to 90% off popular snacks from all around the world, kitchen appliances and even restaurant vouchers. If you’ve been eyeing the newest Coke Plus Coffee, you can get it on 1 Nov at 41% off! Mummies and daddies, mark this date down because toys, kids and babies products will be going at up to 90% off! Some deals include the cult favourite Tokidoki MiniBe Bag at 40% off, Yoya Noble Cabin Stroller at 18% off and more! Create your dream home with deals at up to 90% off! Some deals include the popular Dibea D18 Cordless Vacuum Cleaner at 26% off, Seahorse Bolster and Pillow Bundle Set at 50% off and more! Awake the fashionista inside of you with the best fashion deals on 4 Nov with up to 90% off top fashion brands like Fjallraven, Kate Spade, Superga, Champion and more! It’s time to either be a chao keng and apply for leave or simply pontang school because you’ll want to camp out for the upsized 9 Flash Deals time slots that’s going to happen on 5 Nov only! You can expect deals including the Super Smash Bros Ultimate Switch Bundle, the Clinique Moisture Surge Ultra Hydration, Fitbit Versa Watch and more at crazy discounts! Of course, we’ll have something for all the men! Get up to 90% off men’s fashion, grooming, consumer electronics, games & hobbies, sports & automotives on 6 Nov only. 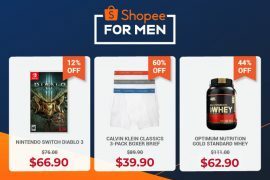 Don’t say we never say because you can expect Polo Ralph Lauren Polo Tees at 76% off, HAVIT G1W True Wireless Earbuds at 40% off, Calvin Klein Boxers at 59% off and more! We’re bringing the best supermarket deals to you! On 7 Nov, you’ll want to camp out for deals that will be going at up to 90% off. You can expect Colgate Plax Mouthwash at 56% off, Dettol Multi-Surface Cleaner at 45% off, and Pringle Deals below $11.11 and more! Mark your calendars because we’ll be having the best beauty deals at up to 90% off on 8 Nov! You can expect the Sephora exclusive Peter Thomas Roth Cucumber Mask at 65% off, exclusive Blackmores Bundle at 48% off, Philosophy Cleanser at 48% off and more! Get only the best deals from top brands like Sennheiser, Nestle, L’Oréal and more on 9 Nov! Camp out for deals like the Sennheiser CX 7.00 BT that will be at 63% off, the NYX Professional Makeup Prep And Finish Set that will be at 40% off and more! If you’re not travelling anytime soon, that’s okay because we’re bringing the best overseas deals to you! Enjoy up to 90% off your favourite buys from China Marketplace, K-Market, Taiwan Collection and more on 10 Nov only! Fun fact! If you were playing Shopee Shake during our Shopee 9.9 Super Shopping Day, you probably contributed to the astounding 500,000 number of plays during the entire period. And this time round, it is back bigger than ever with an upsized pool of over $100,000 worth of Shopee Coins up for grabs! On top of this, you can also invite up to 10 friends to play at the same time to win bonus coins. Set your alarms now because besides Shopee Shake Day on 31 Oct and 11 Nov, you can shake and win at 1pm and 9pm every other day. Expect daily deals released via our Flash Deals page at 12am sharp! We’re talking about Grab Vouchers, JBL Brand Boxes, Champion Socks, Yoya Noble Stroller, Fjallraven Classic Kanken, NMD Human Race Solar Pack Aqua and more at amazing, crazy prices! Hurry, set your reminders now! If you’re heading over to the theatres soon, remember to flash your Shopee app to enjoy a weekday ticket and medium popcorn at just $11! In celebration of our 11.11 Big Sale, KFC is giving a whole range of Finger Lickin’ Good deals that are going from as low as 11 cents! What kind of deals are we talking about? Well, you can get a Medium Whipped Potato at 11 cents, the famous Popcorn Chicken at just $1.10 and a special Shopee Bucket at just $11! Thinking about your next getaway? Book your travel deals with kkday and enjoy 50% off with this promo code! Want to dine for free at Pizza Hut? Simply be one of the first 11 groups to flash your Shopee App at any of Pizza Hut’s 24 outlets on 11 Nov to dine completely free. If you’re late to this party, no worries because you can still enjoy a Classic Large Pizza for just $11! Y’know it’s a sign to start your year-end shopping spree when we’re giving you a 22% off discount on ZALORA from now till 12 Nov too! What are you waiting for? Shop now! If you’re already a Citi Cardmember, you’re in luck! Check out from now till 11 Nov and enjoy $12 off your purchase*. 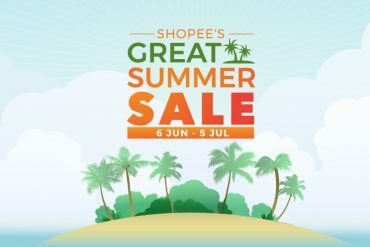 If you’re not a Citi cardmember yet, apply now and get 4 x $50 Shopee vouchers^! *T&Cs apply. Min. spend $80. If you enjoyed our 9.9 Super Shopping Day Daily Giveaways, you’ll be happy to know that we’re bringing it back! That means 14 consecutive days of crazy prizes up for grabs! What can you stand to win? Well, we’re talking about everyone’s favourite Nintendo Switch, Fjallraven Bag, Jujube Bag, the newest GoPro Hero 7 Black, Salted Egg Yolk Indomie, Garmin Watch, Xiaomi Vacuum Cleaner, Dyson Fan, Samsung Note 9, 1,000,000 Shopee Coins and more! Simply follow us on our Official Account to stay updated! And because we’re getting into the Christmas spirit, we’re also holding giveaways on our Facebook and Instagram pages! You’ll want to follow us now because we’ll be giving away a Samsung Note 9 and Galaxy Watch Bundle (Worth $2,000), Xiaomi Fan, GoPro Hero 7, Xiaomi Amazfit Smart Watch, Shopee Coins and even promo codes! You won’t want to miss any of this! And of course, D-DAY where you can expect non-stop deals at up to 90% off on 11 Nov only. You can expect the latest iPhone XR, Sylph Smart Hair Dryer and Drypers Drypantz at crazy discounted prices! We’ll also be having $1.10 Best Buys, a Under $11, $51 and $111 Sale and… HOURLY FLASH DEALS from 12 midnight. You’ll want to postpone all appointments on 11 Nov, because this is the biggest shopping event of the year! Did you enjoy our 9.9 Super Shopper Challenge with AirAsia? Well, we sure did! Which is why we’re introducing the newest 11.11 Shopee x Hotels.com Daily Challenge from 1 to 11 Nov! With the year-end holidays coming right up, this is your perfect chance to win $11,000 worth of hotel stays around the world from Hotels.com! Simply register your interest from 29 Oct onwards and complete daily tasks from 1 Nov to increase your chances of winning! Hurry, register your interest here. What will you be camping out for? Let us know in the comments below! *TNC Applies. Valid for new users from 29 Oct to 12 Nov only. *TNC Applies. Valid for existing users from 29 Oct to 12 Nov only.